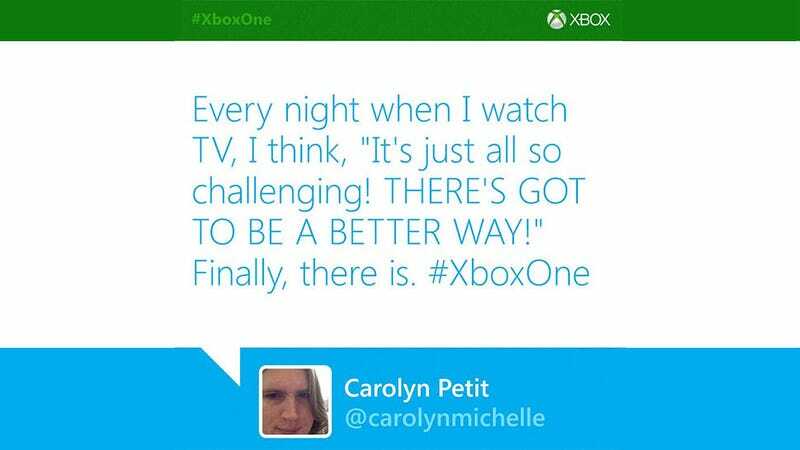 Yesterday, GameSpot's Carolyn Petit was one of countless people online having a little fun at Microsoft's expense during its woeful Xbox One reveal. That Xbox One Reveal Sure Was A Disaster, Huh? Well, I bet this isn&apos;t how Microsoft thought its big day would end. Something one of the employees manning the company's marketing machine didn't take into account when using one of Petit's tweets as a piece of marketing hype (above). I understand sarcasm isn't always the easiest thing to pick up on the internet, but since when would a real human being actually say that?